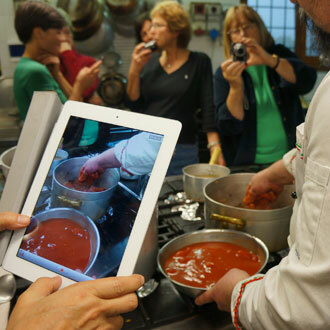 Italians find reasons to throw a food fest about as often as Americans go to the grocery store. Every week, every season, somewhere in one of twenty regions of Italy, someone is celebrating a harvest. Few, though, are as renowned or revered as Tuscany’s olive harvest when the freshest extra virgin olive oil is poured on everything from eggs to ice cream. In my memory, the closest thing to this experience was a nine-hour feast in Paris one night in November when Beaujolais Nouveau hit the streets and all of Paris celebrated until dawn. But touring Tuscany during olive oil harvest season is a little different. Olive oil is the lifeblood of this country and Tuscany is considered the premiere region for its production. Unlike the French, Tuscans don’t kick off the season with a bang. Their approach is much more beguiling. Olive oil slowly seeps into everything until you can’t imagine having a meal without it and soon begin to worry about what will happen after the “olio nuovo” disappears. 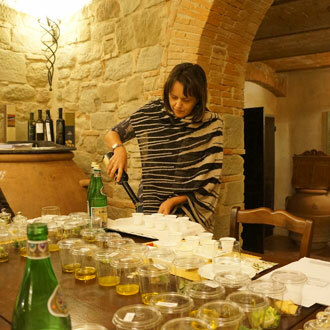 My olive oil adventure was part of a week-long homage to EVOO held at the Villa Campestri Olive Oil Resort, famous for its singularly-focused attention to this essential ingredient. From the first dinner that opened with three different amuse-bouches perfectly paired with three different olive oils and to the last course of olive oil lemon sorbet, it was clear that Villa Campestri’s owner, Paolo Pasquali believes the best way to learn something new is to employ the immersion method. “Amorolio” is the brain child of Pasquali and co-creator, Nancy Harmon Jenkins, celebrated writer and Mediterranean diet expert. Just like language training, the culinary program started with a tasting class in the “oleoteca” to establish a common culinary vocabulary and get all of our senses keen to what lay ahead. The itinerary was carefully orchestrated to build our knowledge from one level to the next – but the program tossed in a few other Tuscan experiences that I suspect were designed to disguise the fact that we were ingesting pretty sizable volumes of olive oil every day. Jenkins provided expert guidance to our small group as we worked our way through kitchen demos and hands-on classes with the Chef Roberto Zanieri, olive oil tastings hosted by agricultural expert, Dr. Gemma Pasquali, and field trips to culinary adventures in the surrounding countryside - made all the more special by Jenkins’ extraordinary access to some of the very best culinary artisans in the region. We took “Mr. Toad‘s Wild Ride” into the Apennines to enjoy a “marrone” festival and a private lunch at Locando Senio, famous for its array of hand-cured salumi. The next day we motored straight south to Florence to explore the vibrant, noisy action at Mercato Centrale, followed by a serene lunch prepared by one of the city’s best chefs, Benedetta Vitali at her restaurant, Zibibbo. I had heard that Nancy Jenkins was well-known for non-stop culinary adventures, but I was not entirely prepared for a week of sensory bombardment. There is a clever method to her madness though. Like how she planned two stops that resulted in the perfect marriage of a classic Tuscan dessert, biscotti dipped in Vin Santo. First by visiting Selvapiana, an elegant winery and olive grove to sample the region’s famous dessert wine, then followed it up by witnessing warm biscotti falling off the oven conveyor at Biscottificio Antonio Mattei, an institution in Italian baking since 1858, and still considered the best source of all biscotti in Italy. Of course, we were not in an entirely “olive oil-free” zone. In addition to their historic biscotti recipe, they make other styles of crunchy confection with olive oil (naturally) like the Biscotti all’Olio or the deeply-flavored Cacao Aromatico e Pistacchi di Bronte. I told you she was sneaky. A particular highlight of the trip was the unexpected participation of Chef María José san Román, the Michelin-starred chef of Monastrell who, along with husband, Pitu Perramon, joined the group for a few days. Chef san Román, known as the Queen of Saffron in Spain, is a relatively new devotee of olive oil. She graced us with a cooking demonstration that showcased the best of both – her own fresh saffron and Spanish olive oils. Getting a lesson in making tapas from a chef just awarded “Best Tapas Restaurant in Spain” took the concept of “small bites” to a whole new level. It was a perfect example of what set this trip apart from other agriturismo options in Italy. A “pinch me”-like schedule that overflowed with best-of-class experiences. 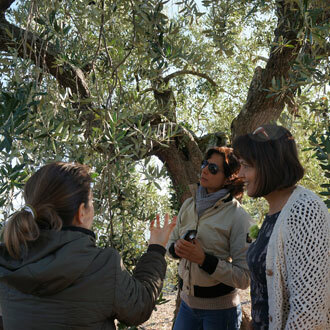 Our final day began with a hands-on demonstration of turning olives into olive oil in Villa Campestri’s own frantoio, then sampling the result with the humble “fettunta”, more commonly known in food circles around the world as bruschetta. A simple, thickly-sliced and grilled piece of saltless Tuscan bread, rubbed with garlic and soaked in extra virgin olive oil, streamed directly from the mill’s spout. It is a combination of exquisite fruit fragrance and aged-old scent that required no downtime for the flavors to marry into a crisp, earthy bite. Our training was complete. Most trips end when the plane touches down at home. But, I’m comforted in knowing I have a secret trip-extender – a precious tin of the freshly-pressed oil I helped create at Villa Campestri. I know it will not last, but I don’t care. I’ll use it with abandon on anything and everything, every day until I eke out the last little drop.